So it’s my turn now! 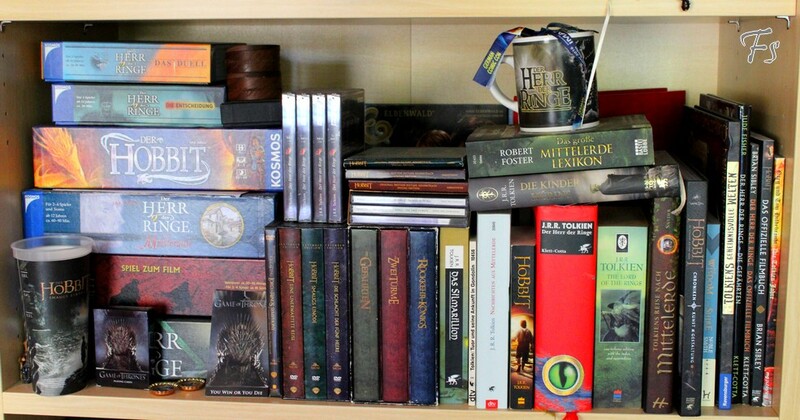 Let’s start with one of my favorite – a Middle-Earth shelfie! May I present you my LotR collection? I love every piece of it! Okay and there is one GoT cardgame on it as well, because I still need to figure out how organise a Westeros shelf. I own “The Lord of the Rings” in German and English. “The Hobbit” just in English, but my Parents have the geman Version as well. “The Silmarillion” , “The Children of Húrin” and “Unfinished Tales of Númenor and Middle-earth” in German. Also of course als Extended Editions of all six movies, and all six soundtracks. Some games and moviebooks as well. Any questions? Feel free to ask. I looove your shelf! 🙂 This inspires me to get into more fantasy. Very great post. I just stumbled upon your weblog and wished to say that I’ve really loved surfing around your weblog posts. After all I will be subscribing to your feed and I am hoping you write once more very soon!